Welcome to a very special year at Seven Arrows Elementary School. Twenty years ago, we envisioned an education where community, compassion, cultural competencies, and cutting-edge education merged to provide students with a competitive global and academic edge. In 1999, we began with 46 students in grades K-4. We now have seven grade levels, three school buildings, and this year is all about celebrating how far we’ve come and all that we can accomplish for each child. I am forever grateful for the hard work so many of our teachers, families, trustees, founders, scientists, researchers, and education supporters have given to Seven Arrows. Two decades later, we continue to grow as relevant and powerful K-6 school that fuses rigorous academics with world culture and the arts. Small by design, our one class per grade learning community provides the best possible social/emotional experiences that both support differentiated learning and interconnectedness among students across grade levels. We are a school community committed to brain research, child development, and the latest and best pedagogical practices. Our school community maintains that meaningful education is ever-evolving and responsive. We incorporate progressive, traditional and research-based pedagogies to deliver a meaningful and positive educational experience for each child. In fact, each student at Seven Arrows has a personalized learning plan that charts their areas of growth and moves at their individual pace. You can find Seven Arrows students at the most competitive independent schools in our city. They enter college as natural leaders, innovators, and lifelong learners. They stay curious and connected to the world they will one day inherit. Please join us for an upcoming group tour this fall. A Seven Arrows student is a creative, compassionate, and critical thinker whose innate talents, gifts and interests are recognized and encouraged by the school and the community. 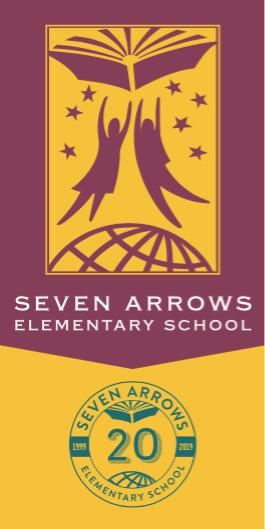 Seven Arrows was founded to educate our future leaders, one at a time, by striving to nurture individual strengths in a supportive and rigorous educational environment. As a result, Seven Arrows is a proven launch pad for student success, as over 90 percent of our graduates are accepted by their first choice middle school. A rigorous, in-depth educational experience is most effective when there is a dynamic partnership among teachers, students, parents and the wider community. Our programs instill a deep and lasting commitment to learning, the confidence to achieve one’s best, and the knowledge that places one firmly on the road to a life full of purpose, meaning and endless opportunity. The primary impetus for learning comes from within the child. It is our mission, therefore, to organize and structure our programs in such a way as to fully engage every student, while being sensitive to the rich diversity of learning styles, strengths and interests. We achieve extraordinary levels of student involvement and achievement by channeling the innate curiosity, creativity, and boundless energy of children into an unparalleled enthusiasm for learning in a structured environment. Our goals go beyond helping our students reach academic excellence. Our diverse, multicultural community of children, teachers and parents strives to instill a respect for self, others and the environment. We share a strong commitment to promoting positive change and peaceful coexistence in the world through the power of education. We believe in pursuing the common good and being active, ethical participants in our local and global communities. We believe in love, caring about others, having compassion, being kind and accepting of differences, and considerate of the feelings of others. We believe in the power of forgiveness. We believe in actively practicing appreciation and thankfulness for all the good in our lives and in the world. We believe in being generous with our thanks and with our hearts. We believe in being honest, loyal, ethical, and staying true to our word. We believe in challenging ourselves, reaching our fullest potentials in academics, the arts, sports, and in the daily challenges we face. We believe in effort, willpower, perseverance and grit. We believe in respecting one’s self and others, property, and the environment. We believe in being fair and just. We believe in being responsible and trustworthy, preparing for school, and being attentive, organized, and accountable. We believe in having self-control.